A Brothers Grimm fairy tale recast in 1980s London features a single mother fighting against long odds for her place in the world. The Brothers Grimm fairy tale “The Juniper Tree” features a wicked stepmother. A pious wife desperately wants a child; her wish is granted, but she dies just after giving birth to a son. Her husband buries her under a juniper tree and remarries, but his new wife, favoring her own daughter, cooks her stepson into a stew and feeds it to his father. Her daughter buries the boy’s bones under the juniper tree with his mother. He is reincarnated as a bird, who sings to the townspeople about his murder. 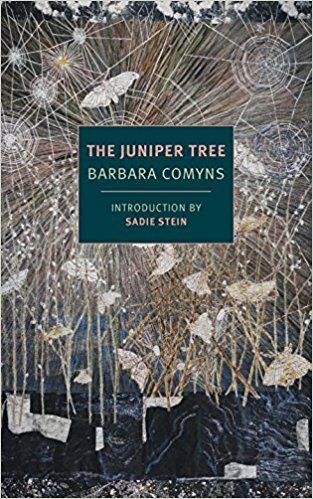 Barbara Comyns’s The Juniper Tree, originally published in 1985, bears an epigraph from the fairy tale: “My mother she killed me, my father he ate me,” but from there diverges sharply from the original. In 1980s London, Bella Winter has had a run of bad luck. Her pretty face has been badly scarred in an automobile accident. She has only recently escaped a manipulative relationship with a selfish man and withdrawn from her unloving mother. She has a young daughter of mixed race she calls Marline, born out of wedlock and fathered by a man whose name she didn’t catch. In the opening pages, she is jobless and homeless, but she is resourceful and unsentimental, and soon finds a home and vocation in a small antiques shop. The friendship of an upper-class couple, Bernard and Gertrude, completes her happiness, and she spends long, sweet afternoons with Gertrude sitting under the juniper tree in the couple’s garden. She even sees a fragile reunion with her mother. This contentment is shattered, however, when Gertrude’s longed-for pregnancy ends in both birth and death. Bella plays an increasingly large role in helping Bernard run his household with the baby, Johnny, and Marline becomes like a sister to the boy. When Bernard convinces Bella to marry him, however, her life takes a turn toward the Brothers Grimm. Bella is a remarkable narrator and protagonist. Practical, independent, resilient, she builds a neat life for herself and her daughter, meeting all their needs and bothering no one. The friendship of the wealthier couple, which brings her such joy, turns out to be a curse, and Bella the tragic hero. Comyns turns the fairy tale on its head and complicates it with class and racial tensions, mental illness and the timeless struggle of a young woman to chart her own course. This is a richer, more relevant, modern rendering of the classic, heartbreaking in its fine attention to detail and its realistic, hardy heroine. While no knowledge of “The Juniper Tree” is necessary to appreciate this version, those familiar with the original will appreciate many subtle references. This edition includes a brief, helpful introduction by critic Sadie Stein, offering context within Comyns’s body of work. The Juniper Tree is a poignant, quietly disturbing novel for fans of strong female protagonists and dark fairy tales, and anyone who roots for the underdog. This review originally ran in the December 21, 2017 issue of Shelf Awareness for the Book Trade. To subscribe, click here.